From the blue gradient of the background to the uniformity of the ribbon bar, there is something eerily familiar to every MCAD software. I have said that learning new CAD software is like learning a new language: the vocabulary and grammar may be different, but the concepts are the same. The second language seems different, but similarities become evident with the third and fourth languages. SpaceClaim was probably the last software vendor to make the CAD world rethink the possibility of direct modeling. The concept was hardly new. Several vendors have been working at adding direct editing functions to their history-only modelers. PTC’s CoCreate had employed the technology since the 1990s. Siemens PLM has had their Synchronous Technology, Autodesk their Fusion, and Dassault Systemes their V6 – along with lesser players. While some vendors busily wrote distinct applications, others merged technology through a hybrid approach. Of the hybrids, the most notable ones are Solid Edge and NX from Siemens PLM that use a combination of synchronous and ordered environments within the same part file. Lesser known is IRONCAD, the makers of the IronCAD Design Collaboration Suite, who began developing hybrid software in 1998, years earlier than any other vendor. In this article, I’m going to dissect some of the main features of Solid Edge’s Synchronous Technology and compare them with IronCAD. I think you’ll find the similarities remarkable. When Siemens PLM added Synchronous Technology to Solid Edge, the first two releases required users to decide right at the beginning of a new design whether to model the part with traditional techniques (ordered) or to use synchronous techniques; a part could not have both ordered and synchronous features. Subsequent releases fixed the limitation, and now both techniques can be used at the same time. IronCAD is similar to the later releases of Solid Edge. 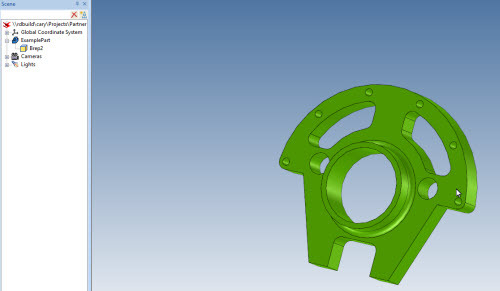 It allows parts to be started in structured mode (equivalent to “ordered” in Solid Edge) or innovative mode (somewhat similar to “synchronous”) – we don’t have to decide. IronCAD’s structured parts allow the traditional feature history to be created, along with direct edit modifications, which appear in the history order. On the other side, IronCAD’s innovative parts have the unique capability of allowing both features and direct edit modifications to mix together, regardless of the feature history order or dependencies. Both modes use the same modeling tools in creating geometry. 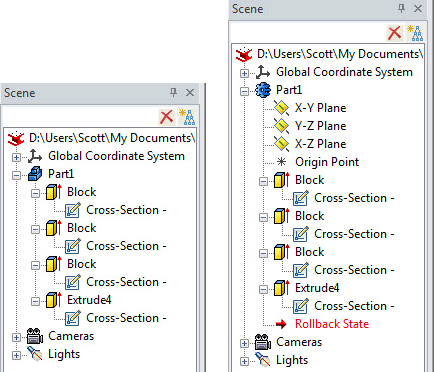 Because IronCAD’s scenes allow for multiple parts to exist in the same file, it is possible to have mix of structured and innovative parts within the same scene. I have yet to come across a practical application that requires one mode rather than the other, and so I am able to add as much or as little intelligence to the design as needed – regardless of the mode active at the time of geometry creation. It really gets down to the speed and number of steps to complete specific operations for a given design, where some need to be parametric while others are probably better off allowing interactive changes (see figure 1). Innovative design allows us to directly manipulate the parts independent of history and constraints, while maintaining unaffected or intact feature history. It is essential for conceptual modeling or when unanticipated design changes occur late in the detail design stage. Structured design allows us to build rigid, feature-dependent parts with embedded design intent. This proves more control over future changes using a predictable structure in the design. Direct edits can be performed at this level, but they will appear as features in the history tree. Before I go to the next section, it may be worthwhile to mention how we can create features in IronCAD. One way is to drag and drop them from the Catalog browser, which contains many starting elements, both positive (extrusions) and negative (holes). Because each starting element is defined by a sketch, it can be edited to a different shape. The other way is to start with a sketch and then apply modeling actions on it, as with traditional MCAD software. 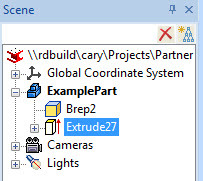 Look closely at the feature trees in figure 1: in both modes, the fourth feature in each list is an extrude, yet the feature was created in IronCAD without a sketch. To do this, I selected the face loop of the U-shaped block as the profile, and then extruded it upwards to create the thicker block. This is a use of an implied sketch in IronCAD. Solid Edge ST would call these areas “regions.” IronCAD does not have a specific name for the sketch-less profiles, but has no difficulty finding enclosed areas to extrude as watertight volumes. If necessary, I could edit the cross-section of the feature in a 2D sketch plane, as if the features were originally formed with a sketch. 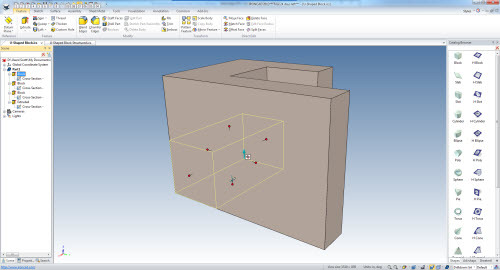 When pushing and pulling IronCAD handles, user-defined distances can be entered, similar to Solid Edge (see figures 2 and 3). 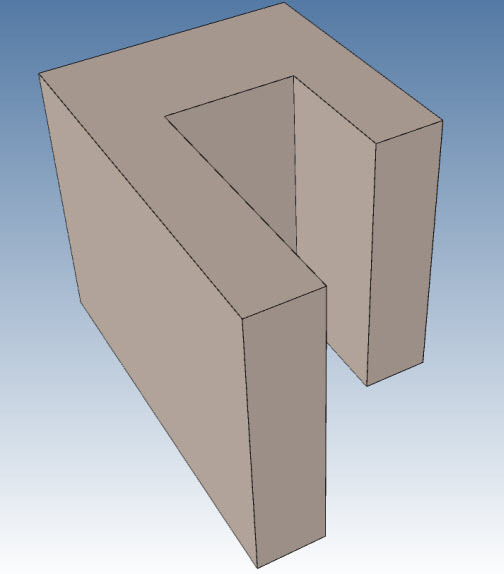 Unlike Solid Edge, however, the default is that the distance entered is not the distance to move the control handle; rather is the final thickness of the geometry. This is known as the “size box” of the geometry. I can, however, right-click to specify the overall distance (see figure 4). 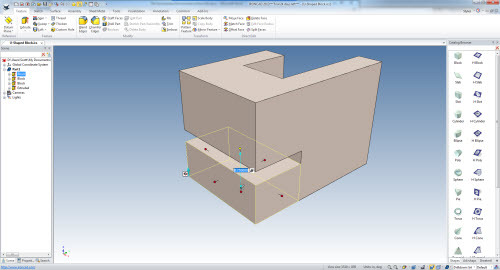 For custom shapes, driving dimensions can be placed on cross-sections. 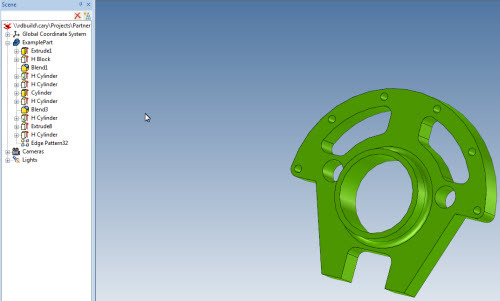 The powerful abilities of Synchronous Technology are based on logic defined by “Live Rules” in Solid Edge. IronCAD has rules for direct edits that can be turned on; I’ll discuss them later. The best way I can explain from where IronCAD gets its intelligence is like this: although geometry is attached as a feature to a part, IronCAD’s multi-part environment means that it can treat features independently. IronCAD not only does this, but then keeps the definition of the feature independent. I verified the accuracy of overlapping geometry by using IronCAD’s Center of Gravity tool: even when features overlapped, the mass did not increase. (The mass is calculated from the envelope of the entire solid, not the summation of the masses.) This capability allows IronCAD to have features that can refer to, and depend on, other features before and after the history order. Figure 5 shows what happens when editing features built in the Innovative Part environment. Without history constraining other features, only the feature being edited is changed. On the other hand, when the same edit is performed in the Structured Part environment, the entire part is shorted by amount of the gap shown, and no gap is created. Up to this point, I’ve discussed only the creation and editing of geometry native to IronCAD, geometry created either with Intellishapes from the built-in catalog or from sketch-based extrusions. 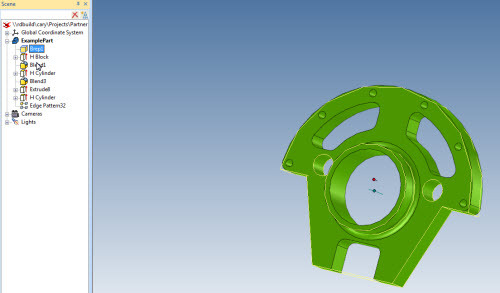 Either way, intelligence is built into the geometry making it easy for IronCAD to place control handles and parameters. So, what about modifying imported geometry? This is a function for which Solid Edge ST is well suited, as it lets us modify imported geometry just like native geometry. Well, this can be done in IronCAD, too. The next series of figures show the steps that take a fully featured solid into a single B-rep solid and back again. (B-rep is short for “boundary representation,” also known as a dumb solid.) The combine option is normally used to reduce the feature history from which direct edits can be made. Figure 6 shows the model as created natively in IronCAD. Several features are selected from the feature tree and the Tools menu to combine shapes. The resulting combination of shapes is shown as a B-rep feature, yet can be anywhere in the feature tree, as shown in figure 7. Depending on the location of the shapes to be combined, the B-rep appears in the history at a location determined by the system; regeneration of the part geometry results in geometry that’s identical to the directly modified result. If multiple B-rep shapes are generated (due to multiple direct modeling operations), then the shapes may be mixed with other native features in the history tree. It is important to understand that they don’t need be at the beginning of the history, nor consecutive with each other, as in some other MCAD programs. Figure 8 shows the model as imported geometry. For our example, we took the original feature based model and combined all the features into a single b-rep to illustrate an imported model representation. As mentioned earlier, this is not a normal practice and direct edits are normally applied to individually selected faces where the system will determine which features to combine automatically for you. Figure 9 shows the model converted to (or imported as) a B-rep feature. The solid can be modified using direct manipulation, as IronCAD attaches control handles to individual faces. Adjacent and tangent surfaces adjust to maintain the solid as watertight, based on the selected set of surfaces being edited. I found initially that multi-selecting surfaces and editing them as a group results in different solutions. However, by opening the Property Browser tab, I found the AutoSelection option, such as coplanar, to control what I want in my selection set. Figure 10 shows feature recognition being done on an as-needed basis by selecting a group of faces and then converting them to an Intellishape through the in-context menu, as shown in figure 11. With IronCAD, there is little reason to have a feature recognizer run on import; for example, the slot on the right was converted into an extrude cut. The cross-section of was recreated and the feature can be edited as if it was a native IronCAD feature. Figure 12 shows converting a large hole (selected on the left) to an extrude cut feature. When converting holes to features, IronCAD is smart enough to search for similar geometry and create patterns from the features. At the same time, a pattern feature is created to define the large hole on the right in figure 12. 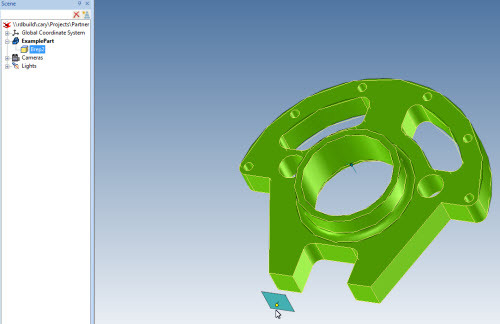 If one of the smaller holes is selected and converted to a feature, then IronCAD would include the remaining five holes as a pattern, which is created at the same time as the hole feature. IronCAD automatically determines which features are necessary to perform operations, as well as the resulting B-rep, while inserting them into the history order. As it can be difficult for users new to direct editing to determine which 3D elements are going to be edited, IronCAD highlights the features affected by direct editing prior to the modification; this lets them see whether they want to proceed or not. Because the process is automatic, users don’t need to make a determination between direct and history, as the system does this for them. (In the upcoming 2014 release, if direct edits can modify a feature or sketch, then IronCAD will do that instead of the direct edit). 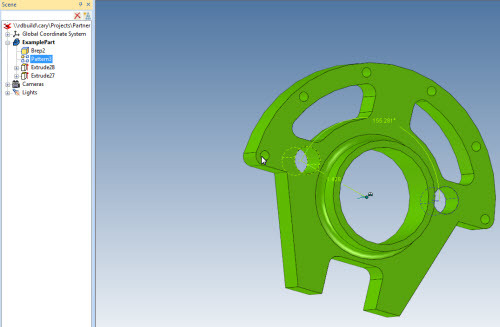 Now that several CAD vendors have joined the direct-editing parade, and with Siemens PLM with its Synchronous Technology at the front of it with the power in Live Rules and the ability to create hybrid synchronous-ordered models), it is a good time to remember IronCAD software has been around much longer than Synchronous Technology. IronCAD had developed its own hybrid modeling approach – pretty much under the radar. 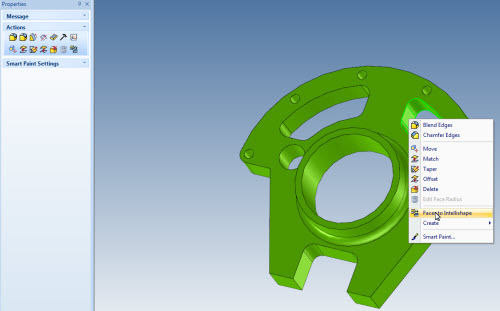 If you are a mechanical designer building custom equipment or dealing with imported geometry, know that IronCAD is a mature option among MCAD offerings.